Submit an Event: Use a desktop size browser. The La Vida Center invites a variety of participants to experience La Vida's outdoor adventure programs that foster character and leadership development through experiential learning and encouraging environments. Adventure Camp provides adventure experiences in a safe environment that allows youth to expand their horizons in healthy and encouraging ways. The mission of La Vida Adventure Camp is to build character, a positive self-identity, and a commitment to serve and care for others. The Adventure Camp uses small groups, experiential learning, personal discovery, team-building, adventure activities, and a high staff-camper ratio to foster this learning and growth. Each week-long session runs from Gordon College campus in Wenham. The Adirondack Leadership Program is an exciting opportunity for 15- to 18-year-old high school students to develop their leadership potential through a 10-day wilderness expedition. 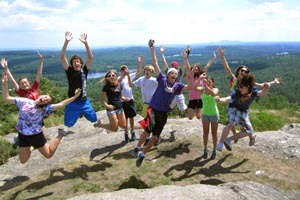 Students travel to the La Vida Base Camp in the Adirondacks of New York, where they build group unity through ropes course activities, outdoor rock climbing and wilderness travel. Participants then have the opportunity to learn about leadership through experience and practice. Working with a team of people, making decisions, serving, and guiding others are all leadership skills that participants will experience. La Vida staff promote discussions, journaling, and reflection to help participants learn from their experiences. We are located in Wenham, MA right off Exit 17 of Route 128 on Grapevine Road.